The Secret to a Happier, Healthier, More Vital Life Is Now Yours! With so many scientifically backed benefits, we just can’t keep it under wraps any longer. The ancient Chinese practice of tai chi has become widely recognized as one of the most powerful ways to improve both physical and mental health. In an increasing number of recent studies, tai chi has been found to heal–almost everything, from lowering blood pressure … to managing stress … to building strength and balance. And, better yet, everyone can benefit–no matter your age or fitness level. No wonder it’s the tried-and-true practice of top-tier professional athletes, weekend warriors, and the elderly! And now, we want to make it easy for you to relax … revitalize … and restore your body and mind. 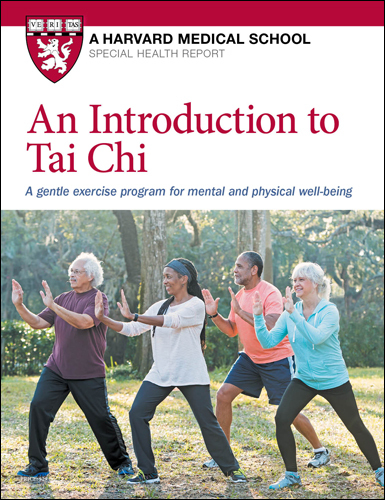 Order An Introduction to Tai Chi today–and SAVE 30% off the $29 cover price! Why you can practice almost anywhere–indoors or out–in as little as 30 minutes. The routine you can do at work right from your desk. How to regain your focus and feel energized while you stand in the grocery line. Whether you’re 50 … 60 … 70 or more … healthy … or frail, you’ll find an exercise routine that’s perfect for getting your qi going. Imagine your feet growing deep roots like a tree. Continue for a few more breaths, relaxing your weight deeper into your roots with each exhale.